LINIAN are delighted to announce their products are now readily available through a network of approved stockists, plus you can order on the go or at home through electrical wholesaling outlet CEF online. This means you can now find their current range of 12 products online no matter where you are in the UK, and also in-store in ROI. CEF is the UKs leading Electrical Wholesale Network with 390 stockists. They have built this by consistently providing customers with excellent quality, service and products. As an engineer, specifier or contractor, the choice of quality of products available through CEF online is excellent due to their comprehensive stock availability and range, all available for next day delivery to site or your local CEF stockists. What does this mean for LINIAN? This means that our products are not only available through a network of valued stockists in the UK, but both LINIAN and CEF have a shared value to ensure that the best products and stock variety are also accessible online. 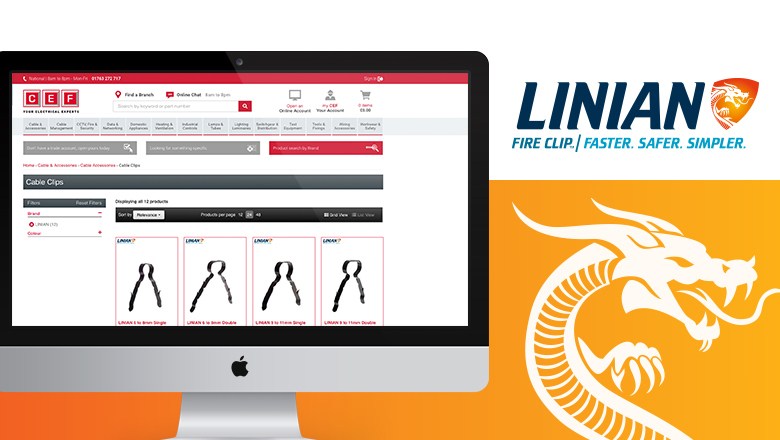 With a two brand new product ranges launching in time for the 18th edition, including the Superclips (will accommodate a range of cables and conduits up to 25mm diameter) and the Twin and Earth fire clips, LINIAN pride themselves on being at the forefront of the industry to make installations faster, safer and simpler. LINIAN’s single component and expertly designed products are faster, safer and simpler to install and they save time, money and lives. This extraordinary evolution of a vital building component requires no additional plugs, screws or washers and can ensure that every job is neater, tidier and more effective than ever. Fire rated and tested to BS50200: PH120 and DIN 4102-12 our products are designed to prevent the premature collapse of cables in the event of fires, ensuring the safe evacuation of civilians and rescuing of personnel.